The ability to purchase a home is vital to the foundation of a thriving community. As Chair of the Golden State Finance Authority (GSFA), I have seen firsthand the benefits that homeownership affords California’s local communities. GSFA has supported affordable homeownership in California for over two decades, providing homeownership programs featuring competitive interest rates and down payment assistance. Over the past 25 years, GSFA has helped more than 74,800 individuals and families purchase homes and provided over $537 million in down payment assistance, as well as provided financing for over 30,000 residential or commercial energy efficiency projects. While GSFA is doing its part to expand access to affordable homeownership in the state, homeownership alone does not constitute a thriving community. Every community needs jobs for its residents and a solid infrastructure platform on which to build its local economy. In 2018, it is vital that such an infrastructure platform include not only high-functioning traditional infrastructure such as water, sewer, and transportation systems, but also a robust broadband network that is accessible to all. Working through its affiliate organization, the Rural County Representatives of California (RCRC), GSFA has identified a number of industry-specific areas of focus for their economic development strategy in California’s rural counties, including broadband and infrastructure. RCRC’s economic development team is working with a network of economic development professionals in RCRC’s 36 member counties to support and catalyze programs and projects that result in job and investment generation. High-speed broadband deployment in rural California is one of the most critical missing infrastructure components. Its absence often precludes unserved and underserved communities from participating in the 21st century economy. 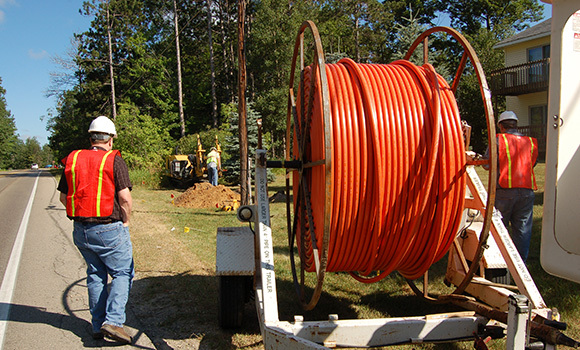 High-speed broadband provides essential benefits by allowing increased economic and trade opportunities for small to medium-sized businesses, access to medical care (telehealth/telemedicine) and educational opportunities, and enhanced public safety – improving overall quality of life. Speed of commerce service is a critical step in the development of strong rural communities. Many communities in rural California are in desperate need of infrastructure upgrades to better serve their residents and businesses, but don’t have the resources, financial or otherwise, to research, apply, and implement these upgrades. These projects include improvements to water, transportation, and community facilities infrastructure. Innovative funding options and other programs that allow for project pooling and access to multiple funding sources that may reduce existing barriers to entry for rural communities must be identified. GSFA and our partners at RCRC are proud to work with the California Economic Summit on their Elevate Rural California program. Together, we can effect real change in our rural communities, benefitting the state as a whole. Kevin Cann is Chair of the Golden State Finance Authority and Mariposa County Supervisor.